Home » Entertainment » Hollywood » Hollywood Buzz » Jurassic Park 4 – Leaked Photo Creates Buzz! Jurassic Park 4 is making rounds in the internet for a new leaked photo. So whats all the fuzz? We all remember Jurassic Park for its terrible CGI effects which kinda destroyed the Jurassic Park effect for us. 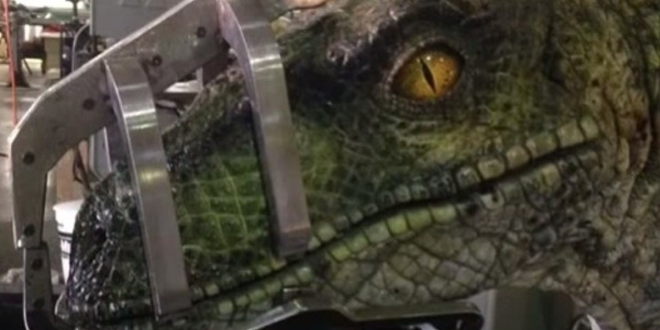 But this time they are making sure not to make any mistakes, NO CGI for new Jurassic Park. The sensation of wonder is one that director Colin Trevorrow is hoping to recapture with Jurassic World, the 4th Jurassic Park movie. Though much of the movie being kept under wraps, a recent image supposedly leaked from the set of the new movie has got movie fans buzzing. The image features what appears to be a velociraptor wearing a metallic muzzle. The detailing is phenomenal and it’s insisted that the dino is NOT the result of CGI. It’s been speculated that the “muzzle” is meant to hold the raptor in place and protect the creation from damage. Others think that the muzzle may have something to do with the plot. Those responding to the hype generated by the leaked image will have to wait awhile before finding out which theory is true. The movie is scheduled to hit the theaters on June 12th 2015.